Garden on the Wall® is an award-winning provider of turn-key, Maintenance-free Garden Installations exclusively for interiors. As the originator and undisputed leader of this new ecological genre in the U.S. Architectural & Design field – and over 50,000 Sqf of Garden installations since inception at 58 of Fortune 500 Companies, major Retail and Hospitality Giants. 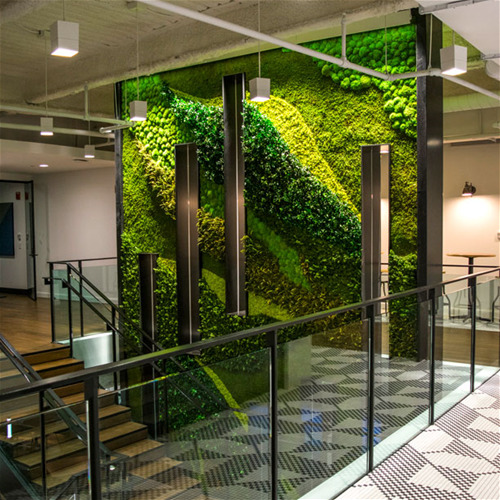 We help achieve our client’s biophilic design aspirations while eliminating all hassles of maintaining a living wall or plants (an automatic time and investment savings). Garden on the Wall is also the winner of Best of Year Awards 2018 by Interior Design Magazine. The confidence of using the highest quality preserved plants, coupled with our meticulous fabrication and installation processes allow us to offer a 5-Year Warranty, although the life span of our indoor Garden Installations go well beyond 5 years, typically up to 10-12 years. Fairfield, NJ – Garden on the Wall (GOTW) announced today that the award-winning firm will be exhibiting at Hospitality Design Expo at the Mandalay Bay Convention Center in Las Vegas, Nevada between May 15th and 17th. GOTW invites HD Expo attendees to expand the imagination as we bring the outside to inside at Booth #3669. 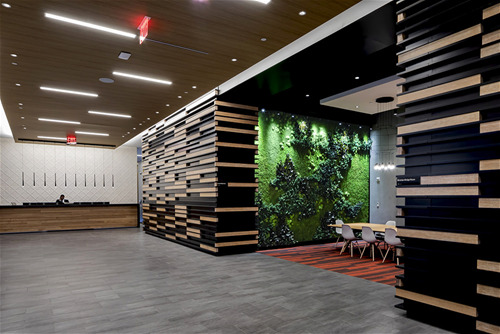 Learn why this Interior Design Best of Year 2018-winning firm has a growing list of Fortune 500 clients and is the preferred partner of the leading architectural firms in the US. Immerse yourself in The Art of Preserved Nature®, and see how GOTW’s unique, turn-key, maintenance-free indoor gardens and modular installations are the ultimate expression of green living. GOTW’s Largest Indoor Garden Booth Display Is a Must-See! The GOTW display at HD Expo is larger than ever, going beyond both physical boundaries as well as the boundaries of the imagination. “Las Vegas invites grander and more spectacular displays,” says GOTW’s Mine Hisim, Managing Partner. “This year at HD Expo, our display will take your breath away.” GOTW’s maintenance-free indoor preserved garden is one of many potential incarnations of biophilia that strike a harmonious chord and make perfect sense in the hospitality space. GOTW is actively welcoming new hospitality projects and is eager to discuss the most ambitious plans of designers with biophilic aspirations, and making their wildest visions come to life… indoors. Sustainability and biophilia go hand-in-hand, practically and spiritually. Both are philosophies that endeavor to create a symbiosis between humans and nature, for the betterment of both. GOTW aims to play a role in creating spaces that enliven the spirit, imbue peace and a sense of wellness, and also form a natural indoor environment that is lasting and enduring. Sustainability is important to all of us as a community, and it is at the heart of GOTW’s core beliefs and the founders’ vision. From plant harvesting to fabrication materials and installation processes, GOTW is committed to sustainable practice and leaving behind no footprint… every step of the way. Garden on the Wall® is an award-winning provider of turn-key, maintenance-free garden installations created with all natural preserved plants. Our gardens require no water, sunlight, or soil and retain their vibrant look for 7-10 years. Our gardens are the idyllic fulfilment of biophilic aspirations for any interior space. Biophilia, the innate human connection to nature, generally defined as the innate human connection to the world of living things, is in our DNA. 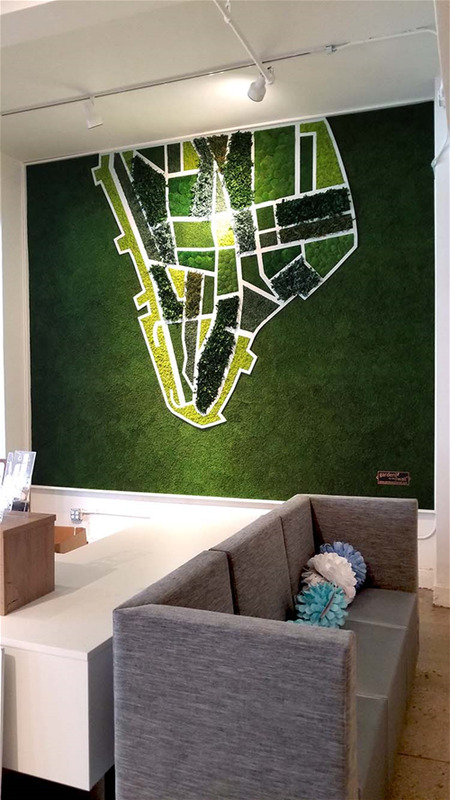 With Biophilic Designs in mind, by essentially integrating Living Walls / Moss Walls to your projects, we wanted to take this opportunity to introduce you designers to our wide range of custom-designed Garden Installations for interiors created using All-Natural Preserved Plants. Our contemporary design pieces are the epitomy of an ART that is made with all natural preserved plants. Each of our Gardens are unique and custom designed for our client's spaces. 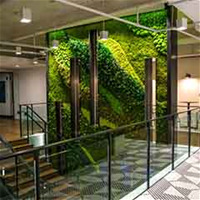 We look forward to partnering with you to bring your Biophilic aspirations to life. Our classic Garden design pieces are the epitomy of an ART that is made with all natural preserved plants. Each of our Gardens are unique and custom designed for our client's spaces. Our cartography collection is our take on maps as an ART that is made with all natural preserved plants. Each of our Gardens are unique and custom designed for our client's spaces.